The heritage of the AONB is integral to its character and quality, creating ‘time-depth’ within the landscape. Field patterns reflect human occupation over several thousand years with significant areas classed as Ancient Enclosure, dating back to the Middle Ages. The stone ramparts of an Iron Age hill fort are still visible today on Warton Crag. Over a third of the AONB’s now extensive woodlands are considered to be ancient woodland, where coppice workers produced both fuel and woodland products, with evidence of charcoal burners’ pits and later iron workings. Numerous small abandoned quarries can be found which were worked by individual farmers or local communities, whilst other quarries developed into large-scale extraction industries that are highly visible reminders of past and current industrial activity. As well as being used for construction of distinctive stone buildings and field-boundary walls, locally quarried limestone was fired in limekilns and used for mortar, lime-wash and as a soil conditioner. 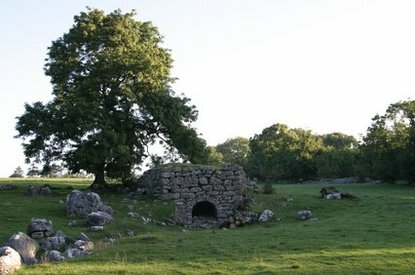 There are 36 known limekiln sites in the AONB, most of which are substantial limestone-built structures and important landscape and industrial heritage features. 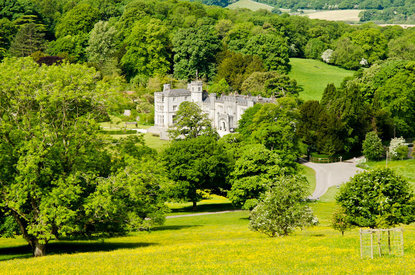 Historic designed landscapes at Leighton Hall, Hazelwood Hall and Hyning Park are of significance and the registered parkland at Dallam Park is nationally important. Stone buildings and settlements created during the last 800 years contribute strongly to the character and quality of the landscape through the design, construction and detailing of individual buildings, the form, layout and pattern of villages and hamlets and the settings of many of the buildings. Much of the vernacular building style dates back to medieval times, when some of the earliest stone buildings were built, such as Hazelslack Tower, Arnside Tower, much of Leighton Hall, Beetham Hall and a number of farmsteads.